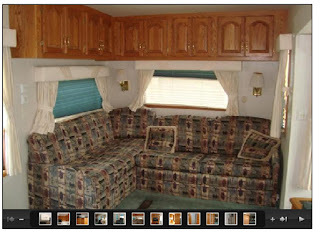 This is the infamous sectional in the back of the RV. Tank LOVES it. It is also the guest bed--the right hand side folds out into a cozy bed. The cabinets above are the library, my scrapbooking, genealogy info and last but not least, the office! It is truly amazing what those little guys will hold! It also came with a recliner which is to the right of the sectional in the back part of the slide out. We have replaced this recliner with one of our leather recliners from home and the end table has been replaced with a wooden chest which holds my scrapbooks and genealogy books. It also has our printer on the top. Next to the recliner, in the front of the slide, is the dining table and chairs. This also doubles as my craft table, desk and scrapbooking area. It is also right next to the kitchen--which makes sense. When sitting on the sectional, recliner and the kitchen table, you can see the entertainment center with 32" TV, stereo that is wired throughout the coach and cassette player (yep, no CD player--Darn!). I placed my two little file cabinet/end tables that were in my office. I needed the end table and I needed file space, and these fit the bill perfectly. The end table on the other end of the sectional is a cabinet that James made in shop during high school. It keeps him close each day! I love having it close. 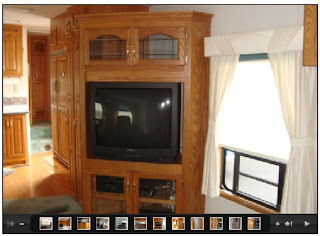 You notice that the entertainment center faces the rear of the coach and is behind the cabinets and fridge which makes it perfect when one person is in the bedroom in the front and the other is watching TV in the rear. It is one of the reasons I chose this unit. Moving on toward the front of the coach is the kitchen. 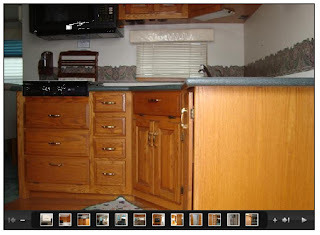 This area has an oak floor and oak cabinets. 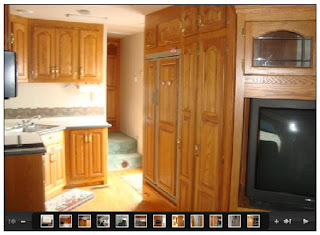 The first cabinet behind the TV is a coat closet. This was a custom built in by the original owners. We have coats in the rack, dog food and cat food in the bottom on the floor as well as a step ladder and above is storage. It's a great space! Next to the coat closet is the pantry with slide out shelves. There is a nice space below and a cabinet above. The cabinet above is mostly empty right now. I am sure I will find something to fill it! The space below has tins that hold food. Tins are just perfect in the camper. They do not break, but do a great job of keeping moisture and bugs out of the contents. I'm so glad I kept some of my tins! 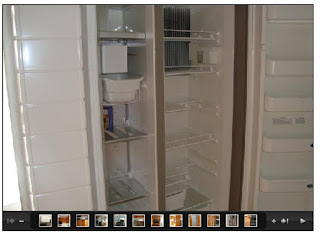 The fridge is really great for a RV. It is a side by side with ice maker and wooden doors. It works on either electric or gas. Above it is two cabinets which right now hold my cookbooks and the books for the camper along with some of my million or so candles! You guys know me--even though I sold and gave away a LOT of candles (giant understatement huh Cheryl?) I still have a huge amount which are stashed around the camper in small areas and this is one of those areas. Now that fall is here, I have really enjoyed the candles. They add a warmth and scent that is hard to duplicate otherwise. Below the fridge is a long drawer that holds my lighter items like plasticware, tools for the grill, Jr. Nation insulated holder, plastic tablecloth, etc. It would seem like the perfect place to put pots and pans, but I felt it might be too much weight for the size of the drawer. I would love to have a few more of these! :) The outside door is next to the fridge. Across from the fridge is the stove and microwave/convection oven. Below the stove are two drawers which hold my pots and pans and a third area that holds one of the two furnaces. Above the microwave is a cabinet that holds my coffee--this is a very important cabinet as you know! :) The little drawers next to the stove hold my candle lighters (also used to light the stove), my kitchen gadgets, my foil and dish towels. The sink is in the corner. 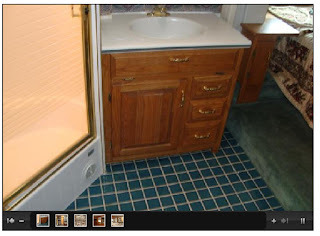 It has one of those little door/drawer niches to put your sponge and small sink stuff. Under the sink is a nice amount of storage and the water filter for the drinking water. Above the sink in the corner is a large lazy susan which makes that area much more useable. Great for spices and snacks! 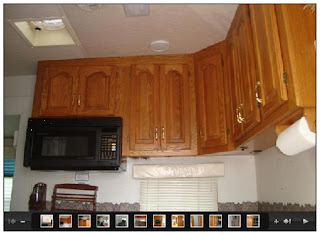 Then, there is the cabinet on the bottom next to the sink. It has 3 roll out shelves. This has my large stock pot, toaster, mixer, hot pads and eating utensils. Above this are 3 more cabinets which hide my breadmaker (and I am thinking it is about time to break this out if the weather continues this way! ), crockpot and tins that hold food like pasta to keep them fresh. This kitchen really holds a lot of stuff! Much more than I would have ever guessed! The countertops are solid surface corian. After we purchased the RV, I found a Danby dishwasher through Wal-Mart online (had it shipped site to store) that is only 18" wide and fits next to the stove perfectly. When it is full, we roll it over to the sink, hook it up and run the load. It really does work well. It holds place settings for 8--or so it states. The top rack moves up and down to accommodate pots, pans, tall glasses or tall pans, etc. It even has a stainless steel interior! I checked it out online and it got really good reviews. So far, so good! Next to the cabinets are the stairs and hall that lead to the closet that holds the washer/dryer. I don't have a pic of that at this time, but it has two doors that open to show the whole interior which was previously a coat closet. Since we got the euro model Splendide into which you place the clothes which are then washed and dried in the same unit, there is not as much space to hang things, but short coats would fit. Right now I just hang my plastic bags and extra hangars. Through the door to the left is the bath. It has ceramic tile which I found out last weekend really wakes you up on those chilly mornings when your bare feet hit it! Yeowwwwww! The toilet in this unit is porcelain rather than plastic. I am not sure why that was important to me, but I like it! The shower is a corner unit and has a great shower head! I really expected not much, but I do like it! The sink has a corian countertop with integrated sink whcih makes it easy to clean. It also has 3 drawers and a door to hold the towels and makeup. Above the sink area is the medicine cabinet. There are three doors there that hold everything! Again, I am surprised by the amount of space! Open to the bath is the master bedroom. 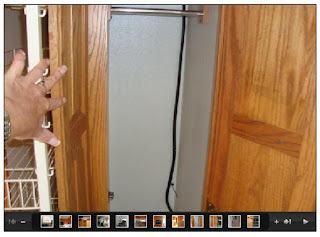 There is a door that slides across if privacy is needed. 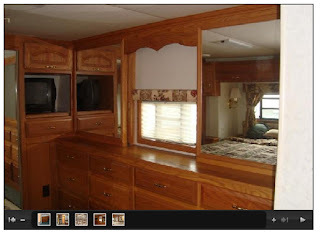 The master bedroom is in the gooseneck of the unit. It has a queen size bed. We removed the mattress and replaced it with our select comfort mattress. I like a king bed, but this unit didn't have it, so one makes choices. The select comfort mattress is really great though! The bed lifts up so that you can stow the blankets under it. Behind the mirrors is the clothes closet. It is tall enough for our clothes and has two shelves under it for shoes and other storage. Next to the closet is the TV cabinet. The shelf comes out so that you can view it from the bed. Above the TV is a cabinet that I found is great for Sheets and pillow cases. Below is a drawer. Across from the bed is the dresser. There are twelve drawers for socks, t-shirts, etc. and plenty of space on top for normal dresser stuff. You can see the his and hers mirrors, but what is really neat--there is a mirror that slides across the window for complete blackout for those mornings that you just want to sleep! How cool is that?!!! So, I hope that you have enjoyed the tour of our new home. Of course, it doesn't look quite like this anymore. Some of the decor has been changed and more decor has been added. We are truly making it our own and it is feeling cozier all the time! Come and see us--if you can find us! :) It's late and rainy, so I am heading to my nice cozy bed! I woke up this morning to the pitter patter of rain. I am talking rain to beat the band (where in the world did the "beat the band" saying come from anyway?). I rolled out of bed, threw on my sweats and took the dogs for a walk to take care of "business". It's 53 degrees outside, so not too bad--and definitely not as cold as it is supposed to be this weekend when the lows are supposed to be low 30's and highs in the low 50's. I may actually have to break down and turn on the heat in the camper! 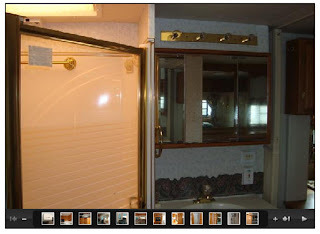 So, I go to Craigslist and start looking at RV's in our area. Gosh! 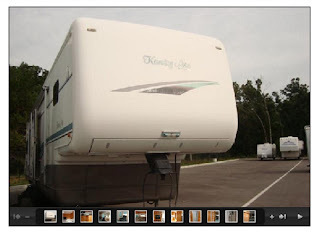 I see RV's that are 15 years old for $30,000 and RV's that are 2008 models for under $20,000 (just lost our job and need to sell quickly it said). I am thinking Wow! 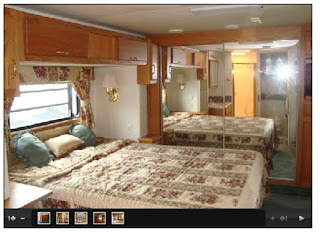 An RV that is only a year old, 40' long--wow! So, of course, I call the guy for more photos and find that it has leather furniture (a must for pug people!) and everything! 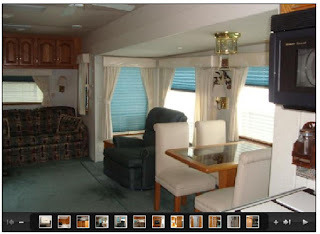 I also see a 40' in Wichita with a kitchen in the rear that looks interesting and really seems to have a lot of space since the kitchen is in the rear making the whole coach open. 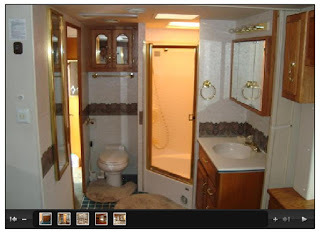 I think I will look at that one to see the floorplan. But, it is more than the 2008 model. How can this be? Then, there is an Avion in Salina and a lovely looking one in OK and a couple in TX and some in Missouri--but the prices are all over the place! Then, I find out about my little friend...the RV NADA! Really?! Okay, I know this sounds crazy, but I didn't even know there was such a thing! Halleluia!!!!!! Not only does this book tell you what the various prices are for the RV's, but also what they sold for new! Yahoooo!!!! So, I find that the one that is only a year old was about $26,000 new in 2008--and lets not even think about how it is constructed. Cross that one off. As I read about the chasis and other components of RV's and 4 season RV's (which we will definitely need since we are going to be living in it), I begin to see that I want something that sold new about $70,000 or more and I want two A/C units. Motor coaches are out of reach beginning at close to $100,000 for used models and what does one do if the motor quits or if the camper part has a major meltdown--then, what do you do? There are good reasons to have a motor coach too! But with the pricing, we decide to look at 5th wheels. I later find out that there is also a difference in the sound proofing--with the 5th wheels being the more quiet of the two. 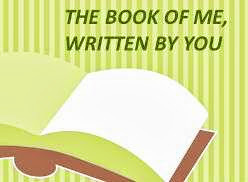 So, I begin narrowing down the list of possibilities and armed with my Dave Ramsey list of how to buy (we were coordinators for Dave Ramsey's Financial Peace University at our church--a GREAT idea for everyone to take!). At any rate, we have a price above which we will not go, a list of amenities that we want to find and are willing to travel as far as needed to get the right unit. I begin locally and go to see the one with the kitchen in the rear. I speak with the owners and find that they have lived in it for about 3 years. They give us a lot of great information on winterizing the unit and how long propane lasts, etc. I have a really good feeling about this unit, so off I go to look. They have it parked at a camper retailer in Wichita. I arrive and the man from the camper retailer gives me the keys and points the direction. I begin by looking at the outside of the unit, the tires, the chasis, what kind of construction, etc. It is a long time before I even open the door to the unit. By this time, the retailer guy comes out to move me into the inside of the camper--I mean, what is wrong with a woman who is crawling around on the ground? Doesn't she know she needs to look at the pretty interior? I ignore him and continue my inspection. When I am ready, I finally open the door. Yes, I look around to get the idea of space that a rear kitchen gives and then on with the inspection looking inside of the upper cabinets for signs of leaks. Looks great in the Living Room and Kitchen portions. The yappy salesman is following me around by this time--really weirded out by this woman who doesn't seem to be interested in the decorations and wooden floors and cabinets. I tell yappy I will think about this unit and leave. I am hot, my face is red from the 99 degree heat and I need a/c! But, I have a feel for the rear kitchen and I really like it! Something to add to the wish list. So, I stop at the other dealers in Wichita as I make my way back towards Augusta. I see some new units that make my mouth water. They have high ceilings and fireplaces! Wow! They feel WONDERFUL!!!! But, they are out of my pricerange. I do find, however, that unlike car dealers, cash talks. They will come down $10,000 immediately which brings some of the units down closer to my limit. But, Dave is sitting on my shoulder telling me to stick to my guns. Get a deal says Dave! OKAY!!!!! So, on I go. I find that anything under 36' is just too tight to even consider living in full time for me. So armed with my new info, that begins to shorten my list of potential units. I have two in TX, one in Columbia, MO, two in Wichita, two in OK, one in Salina and one in the country in KS and a couple in Springfield MO area. My brother Tom looks at the one in Columbia for me. Good shape, but no place for a washer/dryer. Out! I check out the ones in Wichita. One has a huge leak in the kitchen area that has damaged the cabinets and the other one is possibly on the list. Who do we know in TX? Well, my hubby's cousins live down there by the consignment place in TX. I ask him to call them and ask if they can go and look at a couple of units. By this time, I am getting to know the brands and years. I know I want to look at those units. He doesn't want to call them ask them. After a couple of weeks, he finally relents and his cousins readily agree to go look. I call the place and both units have contracts. Oh well, guess they were not meant to be. I head to Springfield next--actually Strafford, MO to look at two units. One unit will need a motor for the large slideout and really looks like it has been abused a lot. The other unit is a 40' Kountry Aire that looks well cared for and has a new rubber roof, new 19' awning, new satellite dish, etc. I wonder about that and find out that a tree limb hit it in a storm and it has been repaired. Makes sense. 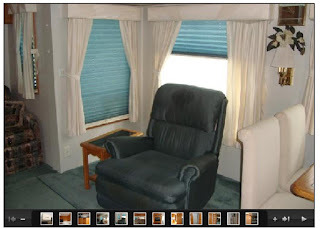 This unit actually has a sectional in the back--something that I have not ever seen before in a RV. The salesperson, Cindy, was very nice and I even got the opportunity to see a couple of their new toy haulers--which I love! I keep looking at them and thinking of the garage as "family room!" However, they are more expensive than my limit, but they are definitely in my mind for the future! On the way home, I see many RV dealers, so make a circuit of them as I travel. 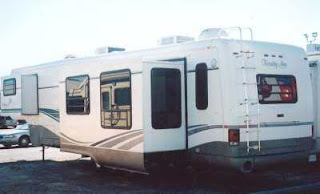 There is a dealer that gets RV's from insurance companies, fixes them and resells them at a deep discount. 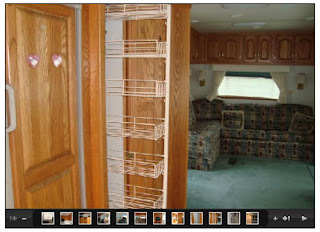 He has a RV with the kitchen in the slide. This is a floorplan that I have wanted to see. I take a look and readily decide that I don't care for that particular unit. Feels tight to me. By this time, I have found that I want the 40' unit with the normal height roof. Many places have low bridges that don't allow the taller units with those lovely spacious feelings. I want 3 slides minimum, but the unit in Strafford feels really great with the sectional. The units in OK have roof problems and I find out that it is $6,000 to replace those roofs. Out! The one in Salina is still in the running and the one in the country in KS. The Avion in the country turns out to have been abused and I get a bad feeling from it. Out. I keep coming back to the Kountry Aire in Strafford. So, I call and tell them that I am interested. Jim and I set out and take the dogs with us. Tank, our 155 lb dog gets up in the camper and spies the sectional. He heads straight for it, jumps up and goes to sleep immediately. Guess he has made his decision! It is 100 degrees this day and the camper is HOT! We crank on the a/c units and it cools down very quickly. Yeah!!!!! I might add at this point that the people at Camping World in Strafford are nowhere to be found. We are trying things out in the camper blindly. I called them before starting out so they knew we were coming down. Each time I have a question, I must go hunt them down. We finally get a service guy to show us how to get the drawer open on the camper so that it can be plugged in and we can try things out before buying this camper which comes with no warranty. After hunting the people down again, we do find that a washer/dryer can be put into the camper and arrange for that to be done at Camping World before it is picked up. After much internet searching, I find a couple of brands which seem to be the pick of people and choose the Splendide euro type unit (put the clothes in and it washes and then dries them in the same unit). We agree on a price for everything and will return when our driver (my brother Tom) is available. The salespeople agree that the work will be performed on a few minor details and the washer/dryer installed and then they will go over the unit with us when we pick it up as they don't have time on that day. Okay. So, we contact Tom and he lets us know when he is available. I give Camping World a call and let them know when we will arrive. They state that they will have it ready to go and we will go over the camper together, at which time, they will tell me about the camper and it's components. Sounds great! I take off at 5 am and head to Strafford arriving before Tom and expecting to meet these wonderful folks who will introduce me to all of the parts of my new camper. Hah!!!!!! Again, I have to hunt them down over and over. They disappear to get a key, find a book, get whatever and never return. It is like dealing with an ADD child! I am ready to put a leash on them so that I can keep them long enough to go over the darned unit! Tom gets there and is ready to roll. Wants to get it to Augusta before dark just in case there is a problem. I am still trying to keep one of their people long enough to get the paperwork done and go over the camper. They do not have the temp tag, they do not have my paperwork, they do not have my keys, they are simply not ready, though they had more than a week's notice. And, everytime they disappear and I find them again, they reek of smoke! They are off taking smoke breaks while I wait????!!!!!! Arghhhhh! After spending hours (literally) trying to wrangle these people, I am getting angry! So, I begin to let it show and ask them if anyone is actually going to help me, or what!!!!! I have to go. My driver is here! I need my temp tag! Let's move it people! The lion is very much on the verge of appearing and leaving some marks!!!!! Tom, having owned several campers, is really used to them, so we begin going over it. He is showing me the various parts of the camper. We are ready to hook up and leave and still no salespeople in evidence! I am seriously considering yelling by this point! I go into the the place (stalking by this time) go to the manager's door and say I am ready to leave and I want my temp tag and keys NOW!!!!! I have been here for hours and am quite unhappy. Get someone out there NOW!!!! We are leaving NOW!!!! And I stalk back out. By this point, about 3 people are running out with various items and the rest are running for cover. We hook up and go. Fortunately, there are no problems and we get the camper out to it's parking place in the country about 8 miles from our house in Augusta with no incidents! Thank goodness! Would I want to go to Camping World in Strafford, MO to purchase a camper ever again? Uh NOOOOOOO!!!!! What a poorly run organization. Yes, I know it wasn't a new camper, yes, I know it wasn't the most expensive on the lot, but come on! Are you there to be in business next year, or just to drink coffee and take smoke breaks? So, I am ready for lunch. Next, a little tour of our new home!